First: ISIS must be destroyed. pull ISIS chestnuts out of the fire. From handing them weapons to allowing them to escape when they are trapped in places like Raqqa, it almost seems like the US does not want to really see the end of ISIS. It is clear that he lied, as it is reported that he signed off on this new Syria strategy last month at a meeting of his National Security Council. The United States believes that free and transparent elections … will result in the permanent departure of Assad and his family from power... Assad’s regime is corrupt, and his methods of governance and economic development have increasingly excluded certain ethnic and religious groups... Such oppression cannot persist forever. ...our expectation is that the desire for a return to normal life … will help rally the Syrian people and individuals within the regime to compel Assad to step down. Translation: we are going to continue to make life miserable for you until you overthrow Assad. Then it will return to "normal." Presumably the people of Syria understand what "normal" life after a US "liberation" looks like from examples like Libya, Iraq, and Ukraine. 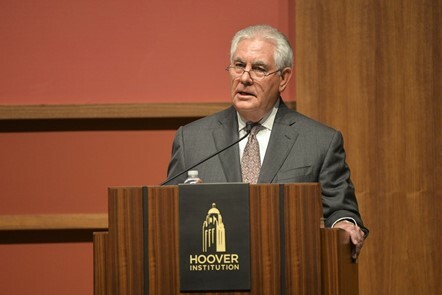 Tillerson also made the bizarre assertion that US troops will remain in Syria to prevent the Syrian government from re-establishing control over the parts of Syria abandoned by a defeated ISIS. So the legitimate government of Syria will be prevented by an illegal United States military occupation from reclaiming its own territory? This is supposed to be a coherent policy? Third: Refugees must be returned to Syria. America has an opportunity to help people who have suffered greatly. The safe and voluntary return of #Syrian refugees serves the security interests of the U.S. and our allies and partners. We must give Syrians a chance to return home and rebuild their lives. But the one event that led to the biggest return of refugees back to Syria was violently opposed by the US government: the Syrian government's liberation of east Aleppo from al-Qaeda control! The US military is busy creating a 30,000-strong Kurdish militia to reportedly guard Syria's borders with Turkey and Iraq. NATO-ally Turkey is violently opposing US moves to further arm Kurd groups that it considers terrorist. The discredited "Free Syrian Army" (FSA) is back in Washington begging the Trump Administration to re-open the CIA weapons pipeline. The FSA is perhaps best known for immediately handing any weapons it gets from Washington directly to al-Qaeda in Syria. Will Trump's neocon-filled ecosphere convince him to once again put some wind in al-Qaeda's sails? Will Congress awake from its slumber and finally dust off the part of the Constitution directing the Legislative Branch to decide on matters of war and peace? It's probably an ill-advised bet, however there are a few whispers on Capitol Hill that a shift in US military focus from anti-ISIS to anti-Assad and anti-Iran might be slightly problematic. Secretary of State Rex Tillerson has just unveiled a 100 percent neocon approved "new" US policy for Syria: No more pussyfooting around. We won't abandon our project in Syria like Obama "abandoned" Libya (presumably, as the neocon myth goes, on the verge of becoming a new Switzerland after its "liberation" only to be thrust back into the mire by Obama's premature withdrawal). President Trump is set to out-neocon the neocons with this foolish and destructive policy. The showman is shown to be nothing but a fraud. I’ve already read this book. Oh wait, it was about US-China in 1949, “A Force So Swift”. The 28th Amendment to the CONstitution: If you ain’t with us, you’re against us.